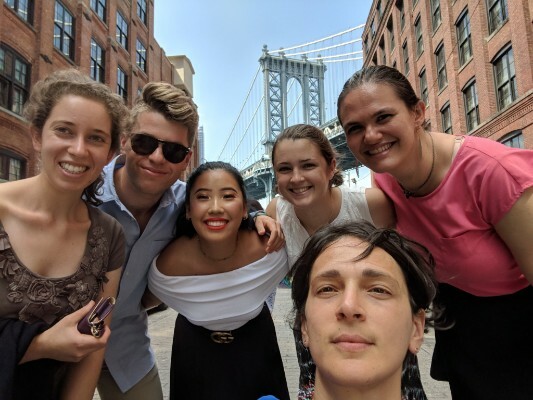 *Note from the Editors: This article is reprinted with permission from Lynda Albertson, CEO of ARCA. The original is available here. Since 2007 Tsirogiannis, a Cambridge-based Greek forensic archaeologist has drawn attention to and identified antiquities of potentially illicit origin in museums, collections, galleries auction houses, and private collections that can be traced to the confiscated Giacomo Medici, Robin Symes-Christos Michaelides and Gianfranco Becchina archives. Tsirogiannis teaches as a lecturer on illicit trafficking with ARCA’s Postgraduate Program in Art Crime and Cultural Heritage Protection. On May 01, 2018 ARCA was contacted by Christos Tsirogiannis about a possible ancient object of concern in an upcoming Sotheby’s auction titled ‘The Shape of the Beauty: Sculpture from the Collection of Howard and Saretta Barnet’ scheduled for 10:00 AM EST on May 14, 2018 in New York City. The antiquities researcher had also notified law enforcement authorities in New York and at INTERPOL. 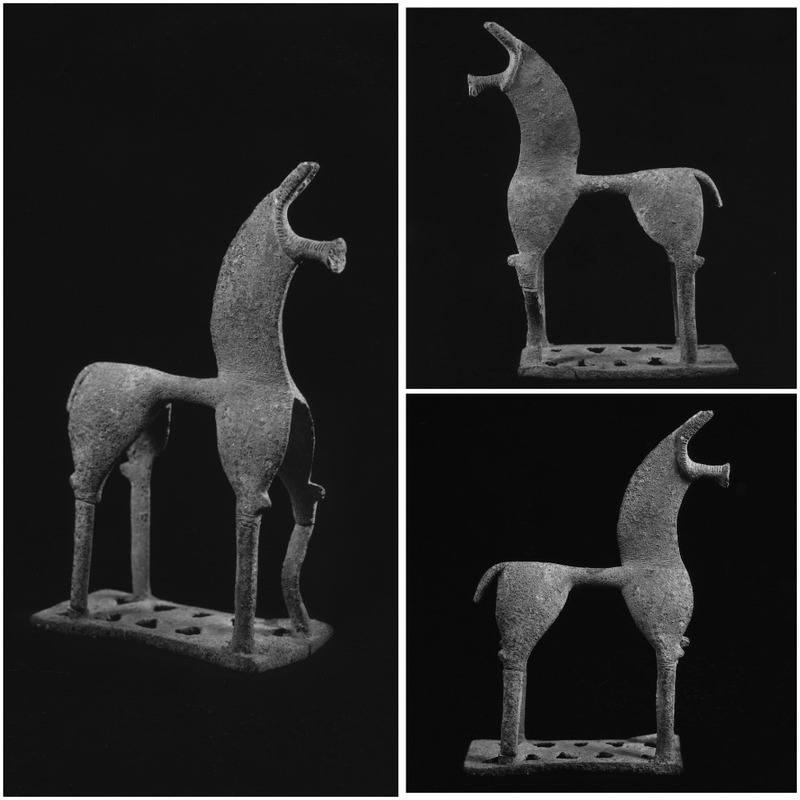 For its literature, the auction house mentions the following text: Zimmermann, Les chevaux de bronze dans l’art géométrique grec, Mainz and Geneva, 1989, p. 178. Saretta Barnet died in March of 2017. Her husband had passed away in 1992. Collecting for more than 4 decades, the couple’s collection included everything from pen and brown ink landscapes by Fra Bartolommeo, works by Goya, François Boucher, Lucien Freud, tribal art and a noteworthy collection of antiquities. 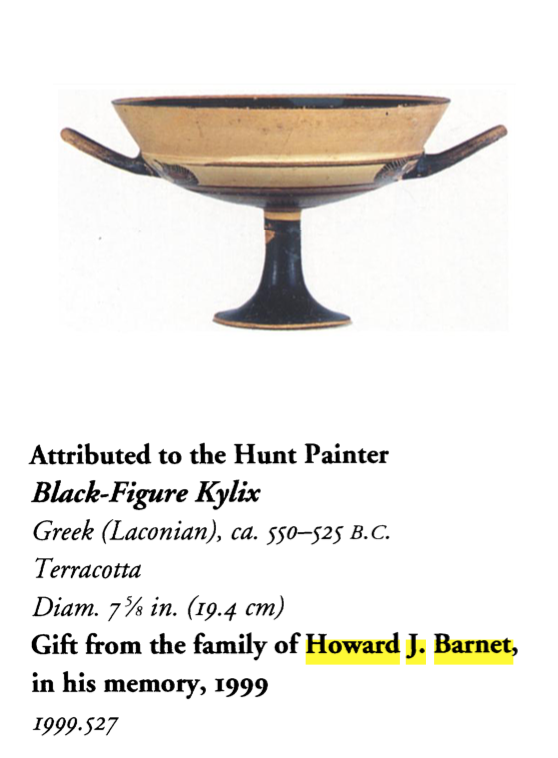 While the Barnet’s may have been selective in the quality of the pieces they purchased for their collection, their relationships with dealers known to have dealt in plundered antiquities such as Symes, as well as collecting transactions with private collectors such as George Ortiz, who is also known to have purchased tainted objects, leaves one to question how carefully the Barnet’s vetted the objects they acquired. Given that the bronze Greek figure of a horse appears in photographs found in the Symes archive and the fact that at least one other object donated by the Barnet’s was tied to illicit trafficking and was repatriated to its country of origin, this statue deserves a closer look. With further research, the object and its past collecting history might lead to a link in the trafficking chain that has not yet been fully explored or considered. Take the provenance listed in this sales event for example. If the object’s listing of a sale at Münzen und Medaillen AG, Basel in May 6, 1967 is not a fabrication, then exploring this sale in Switzerland, determining who the consignor was, might give us another name name in the looting/trafficking/laundering chain which could help us determine the country of origin and be worthwhile for law enforcement in Switzerland and New York to explore. At the very least, this upcoming auction notice seems to indicate that the auction house did not contact Greek or Italian source country authorities before accepting the object on consignment. This despite the object’s passage through the hands of a British antiquities dealer long-known to have been a key player in an international criminal network that traded in looted antiquities. Disclaimer: This article expresses research and opinion of its author. It is intended as general information, not legal advice, and is no substitute for seeking representation.